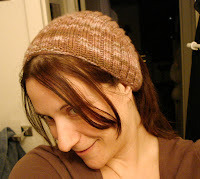 Astrid Cloverleaf: a knitting persona blog: some FO's! yeah yeah.. it's been quite a while since i've updated. and here's some yummy projects to show! and this calorimetry i started last night and finished tonight... it's so cute and actually fits on my big fat head! i used a heart shaped button closure.. it's so adorable and a perfect fit in the hole created in the pattern.